Red Hen Press, 9781597091312, 80pp. “The poems in Elise Paschen’s Bestiary explore domestic preoccupations set against the backdrop of the wild-heartedness, real and imagined, of the animal world,” praises the poet Jason Shinder. In this modern-day Bestiary, or “Book of Beasts,” the line between animal and human is thinly-drawn – the daughter of a Celtic king, through love, is transformed from beast to human; lovers take flight as moon and owl; manatees transform, before the explorers’ eyes, into mermaids. This dynamic runs throughout the collection: taking flight, hovering between air and earth, plunging, and then resurfacing from water. The poems create a constant engagement between what tethers us to our daily lives – marriage, motherhood, raising a family, the loss of parents in old age –and the desire for other worlds. Exploring notions of transformation, these poems cross thresholds between animal and human, between death and life. Award-winning poet, Elise Paschen, creates in her third and most complex poetry collection, work which is elegant and passionate, preternaturally still and reckless all at once. Paschen displays a variety of form and nuance – from ghazals to long-lined free verse poems. Writing out of a distinct Western literary tradition, but tapping into her Native American (Osage) roots, Paschen celebrates the mythic, the unusual, the magical glimpsed in the everyday. Elise Paschen is the author of three poetry collections: Infidelities (Story Line), winner of the Nicholas Roerich Poetry Prize, Houses: Coasts (Sycamore Press, Oxford), and, most recently, Bestiary (Red Hen Press). She is editor of Poetry Speaks to Children and co-editor of Poetry Speaks Expanded (Sourcebooks) and Poetry in Motion (Norton).Paschen teaches in the Writing Program at the School of the Art Institute of Chicago." Can a book so attached to death be filled with so much life? The answer is yes and Bestiary proves it! It is focused also on form and light and wonder; a fine song of praise to living things. All praise to this brave poet and these brave poems! With Bestiary Elise Paschen comes into her own strength as a poet, taking on the two great subjects of lyric poetry, love and death. This volume beautifully contains its opposites: it is at once the story of a young couple building their family and the story of a daughter losing her parents, as well as a more mythic undertaking, a tale of the animals who symbolize our psyches and seem to foreshadow events in our human lives. One feels Paschen’s Osage roots in these poems where she makes the deepest emotions palpable through her stunning craft. 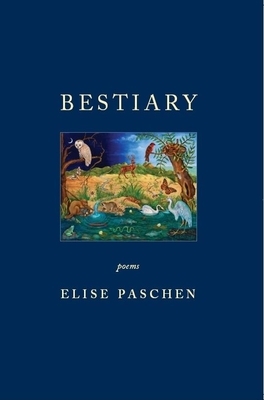 In Bestiary Elise Paschen creates a world at once recognizable and strange, lyrical and fierce, gentle and bold. Elise Paschen’s themes are human and essential: love and gestation and birth, the decline of parents in old age -- and in her skilled hands, these matters seem far from ordinary. Often her poems engage us with stories, some taken from myth -- Leda beset by Zeus in swan’s clothing, a mad Irish princess tamed by a harp player. Others seem drawn from experience, whether actual or imaginary: a woman thrown to the ground by a whirlwind, a family rescuing a fallen nestling, an aged and afflicted mother recalling her youth as a dancer in Venice, a daughter transporting a father’s ashes through airport security. Here are powerful lines, gracefully woven into whole poems, positioned to last. Certain of them will haunt you. Read the lovely and mysterious “Monarch,” first poem in the book, and right away you’ll see what I mean.